Louis was born in Skud in 1896, the eldest of 6 brothers. Louis left Skud in 1913 with his aunt Rochel Paglin (his mother, Ella’s, sister)and her five daughters: Agnes, Ettie, Bessie, Frieda and Ada before World War l (1912 or 1914). This was when his youngest brother, Sydney, was born. They went to South Africa. 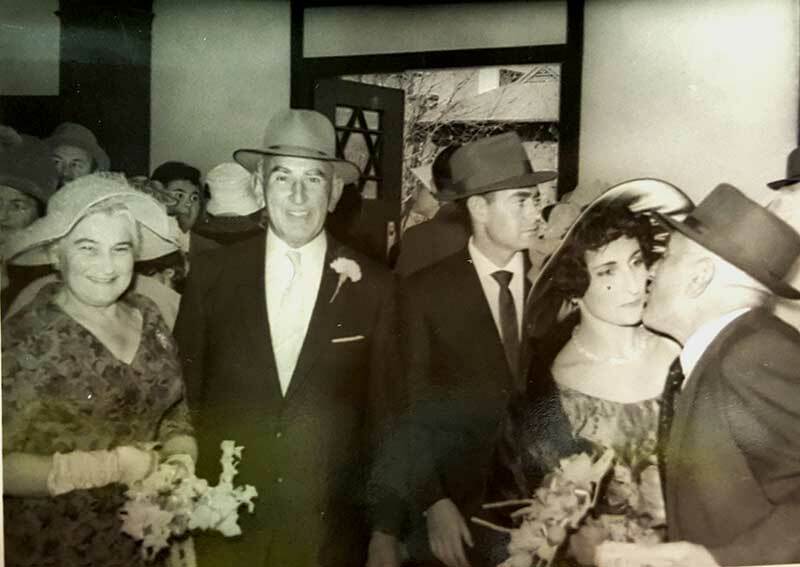 Rochel and Shae Paglin, with their daughters, moved to Senekal in the Orange Free State, and Louis went to Edenvale in Transvaal to work for Harry Sneech, who was Ella and Rochel’s first cousin. For the first two years Louis didn’t earn any money; he worked for his board and lodging. The next few years he earned £2 a month. He lived on £1, and the other one he sent to his brothers to help them come to South Africa. 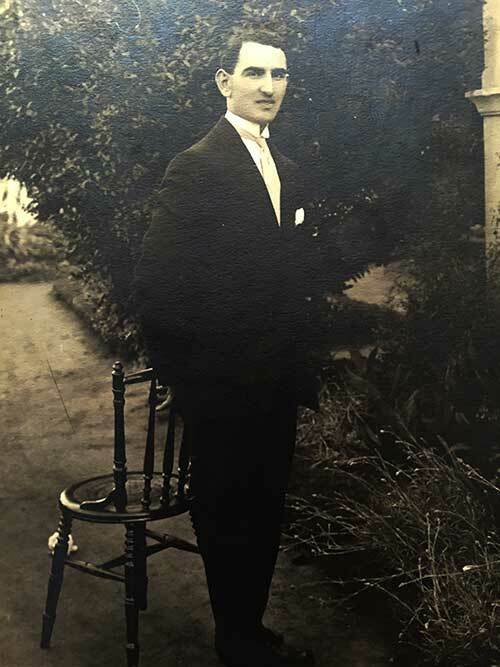 In 1927, Louis went to Benoni and opened a grocery store with a cousin Zunde Frankel. The shop was called Judelman and Frankel. Louis had a reputation of always being kind, warm and generous, always helpful and friendly, and he was very popular amongst his customers and friends. On January 5, 1930, he married Agnes Paglin in the Wolmarans Street Shul in Johannesburg, but they lived and worked in Benoni. Louis and Agnes had two daughters, Elna, born May 7, 1933, and Naomi, born July 1936. When Elna was born, Ella (Louis’s mother) was very ill, and the name Elna was taken from the bible (a prayer for her recovery) “El,na, refa-na-la” (This was a prayer to G-d by Moses to cure Miriam). Sadly Ella passed away in September 1933. 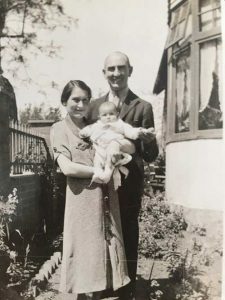 Most of the Judelman grandchildren were named after her, with the Hebrew name Ella. Throughout Louis’s years in Benoni, he was very much involved in communal affairs. He was very active in the Hebrew Order of David (HOD )and in the Israel United Appeal (IUA). He was a regular shul goer. He always supported Agnes in all her Zionist activities throughout the years; her work for Israel never ceased. In 1955, the family moved from Benoni to Cyrildene, Johannesburg, where Louis joined his brothers as an equal partner in Jaybee Brickworks. His job was to answer the phone and provide lunch. His life in Johannesburg continued to be active. He remained a regular member of HOD and IUA, and the Cyrildene Shul was a large part of his life. He loved playing tennis every week, which he continued to do until he was 76. He continued to support and encourage Agnes in her Israel and Jewish National Fund (JNF) projects: The Child’s Growing Garden, where she planted 44,000 trees, and the JNF Memorial Forests, Keren Yaldeinu. Agnes’s dream to go on aliyah was eventually realised in 1975. Agnes was 70 years old and Louis was 79 when they left for Jerusalem and settled in Bayit Vagan. There Agnes and Louis lived a meaningful life, Agnes making sure that Louis was comfortable and happy. They made many friends and were very popular in their new home. After eight years in Bayit Vagan, sadly Louis became ill and passed away in October 1983 at the age of 87. Louis was buried on “Har Hatzofim,” Mt Scopus. Louis was a kind, gentle and caring man, devoted to his wife, children and grandchildren – and to anyone who needed help. He gave of himself with modesty and without any expectation of return. A life well lived.